THE Red Cross won't tell men if their blood transfusion came from a pregnant woman even though new research has found the blood of a once pregnant woman can kill a man. 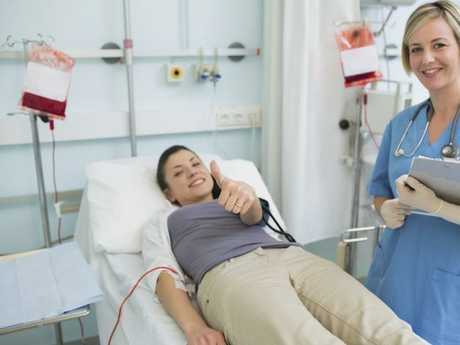 An alarming Dutch study has found men who have a blood transfusion are 1.3 times more likely to die if the blood comes from a woman who has been pregnant at some stage. Nearly 60,000 blood transfusions in six major Dutch hospitals were studied in the research published in the Journal American Medical Association. There were 101 deaths per 1,000 person years among men who received blood from a woman who had been pregnant at some stage in her life. This compared to the 80 deaths per 1,000 person years when the blood donor was male. Men who received blood from a never pregnant woman had a mortality rate of 78 per 1,000 person years versus 80 deaths when the blood came from a man. The research has sparked the mother of all medical conundrums with speculation immunologic changes during pregnancy might explain the phenomenon. Other theories include that there could be a difference in iron status between ever-pregnant female and male donors. Iron deficiency in donors has recently been shown to be associated with worse recovery of red blood cells after transfusion. "Further research is needed to replicate these findings, determine their clinical significance, and identify the underlying mechanism," the authors write. A spokesman for the Red Cross said it had no plans to change its practices in the wake of the research. "The research at this stage is very preliminary, and the study authors acknowledge it has limitations," the spokesman said. The data would need to be verified by further studies before the Red Cross changed its policies, he said. Roughly fifty per cent of blood donations come from women in Australia and donors are asked whether they are pregnant or breast feeding. Women who have given birth cannot donate blood until 12 months after the pregnancy and they cannot give blood while breast feeding, the spokesman said. Despite this the Red Cross says it won't be putting special labels on blood it knows has come from pregnant women. Men who need a transfusion and who are worried about the possible risk cannot find out in advance who donated the blood they are given. However, if there is a problem then the records of the donors will be traced back, the spokesman said. If clinicians had concerns about using blood from once pregnant women in transfusions they could contact the Red Cross, the spokesman said.